I knew right away that since I am not close in proximity to my bridesmaids, I wanted to ask them in a special way that involved sending them something in the mail. Bridesmaid proposals are the new thing, and I thought it would be cute to get them little gifts in addition to a card, asking them to be my bridesmaids. These are the most special ladies in my life, and I wanted to make sure that they knew that. A handwritten card is one of the most meaningful things to me, so that is where I started. I found the perfect hand painted cards with gold foil from hellolovepress on Etsy. I ordered 4 bridesmaid and 1 maid of honor with kraft paper envelopes. I love how they turned out, and that they fit my color scheme. I was able to write personal messages to each of the girls, and stick the card on top of the gift (inside the box). I wanted to collect a few things that would not only go with the colors and theme of the wedding, but that would be nice for them to have, and they could use. I bought bottles of Sally Hansen Complete Salon Manicure Nailpolish in the color "I Lilac You" and a pair of knot earrings from The Limited for each girl. To balance each package out, and to make it more "proposal-ish" I added a Ring Pop in each box. As a tip to those who are making gifts for bridesmaids, and if you have a large bridal party. Use coupons, and wait for sales. I didn't buy all of these items at one time, which made it more affordable, and allowed me to get the girls the nice quality gifts I wanted to give them. My little sister Caroline is going to be 9 when we get married. She wants to be the flower girl, but I think we are going to dress her in the same color as the bridesmaids. So a flower girl/ junior bridesmaid. To send her something special, I ordered a rhinestone applique from Amazon, and ironed it on a lavender t-shirt. This will be something she can wear for different events as we get ready for the wedding. I wrapped the boxes in kraft paper, and shipped them out last Tuesday. Everyone got them on Friday, and I was so excited to see and hear their responses! 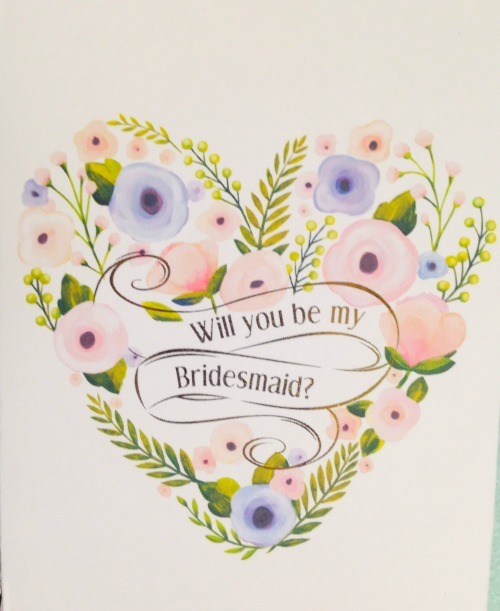 Have you ever made a bridesmaid proposal gift? Do you think it's important? A waste? I'd love to hear your thoughts! I've already heard lots of different points of view! Love this idea! If we EVER get married, I want to do this so bad! It turned out great!! What a cute idea! I didn't do thus for my wedding 12 years ago, but is so thoughtful! I love the idea of a Bridesmaid proposal, I put one together for my girls over the summer and each of them loved to get something special. Seriously, sometimes I want to get married again just so I can make use of all the amazing ideas out there, LOL! This is such a great idea. seriously beautiful! I agree with Lara... I guess I'll just have to wait for my girly to get married. Those cards are so pretty! Personally, anything that makes a wedding more expensive makes me balk, but these are nice. Congratulations on your upcoming nuptials!